The SVG Way: The SVG Way spreading everywhere...!! From making its Online presence since February 2013, "The SVG Way" has now gone viral and marked its presence even on the Cake...!! Thanks to all my beloved friends who brought this Special Cake on my Birthday. 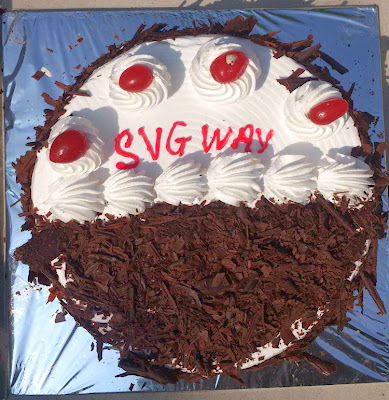 It was really an astonishing moment for me to see the Special Words "SVG WAY" on the cake. It make me feel great and very fortunate having such a lovely and caring friends. You have now encouraged me to work more dedicatedly on the development of the website. I will always try my best to bring more and more interesting and useful stuff from all over the cyber world to enhance your knowledge and to improve your Online as well as Offline experience. All of this will be done in "The SVG Way".